Croatia: National stadium in… Osijek? Could you imagine the Croatian national team leaving Zagreb and moving near the Serbian border? Owners of NK Osijek surely can as they’re proposing to build a 25,000-30,000 stadium there. Back in January the troubled club NK Osijek was taken over by Ivan Meštrović (local) and Lőrinc Mészáros (Hungarian). To date they’ve reportedly spent HRK 30 million on improving the club’s situation and part of it was spent on planning a new stadium. 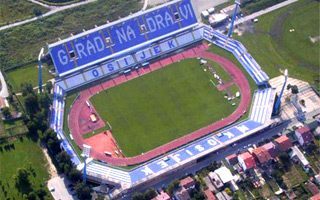 Currently NK Osijek are using the municipal Gradski vrt, but it’s too big and outdated. The proposal was to create a 12,000-seater for football only. Now it’s changed to 25,000 or even 30,000, but only if the national football association (HNS) agree to relocate national team games to Osijek. Capacity seems to be in line with demand for the national stadium, but its location is a different story. While Ivan Meštrović argues that Osijek is well connected with other parts of Croatia and has sufficient hotel capacity, it’s hardly comparable in these terms to Zagreb or the coast. It’s the biggest city in the “far east” of Croatia, along the Serbian border. What speaks in favour of the proposed scheme is its funding. Meštrović and Mészáros pledge to fund at least a significant chunk of the project themselves, even if HNS and taxpayers would also likely have to contribute. Both officials are also understood to have good connections with Hungarian authorities with Mészáros receiving €3.3 million in subsidy from the Orban administration. The Hungarian investor might be eligible for another portion of public money in 2018, if the current donation is managed well. Funding has been the most important obstacle in Croatia’s long and turbulent way to their new national stadium. This is what killed the stunning Kajzerica project years ago. But is it enough to move crucial international games to a city of just 100,000? Regardless of the national stadium scheme, NK Osijek are determined to build their future home. Before they do, a smaller stadium for 3,500 people will be built, very much along the scheme from Rijeka where Stadion Rujevica was built as temporary home and future training stadium as HNK Rijeka await reconstruction of Kantrida.